A Colorado bill which seeks to recognize gay and lesbian couples with civil unions will face its first political hurdle Wednesday. 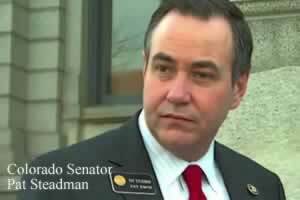 Senator Pat Steadman, a Democrat from Denver, is the measure's sponsor in the Senate. Steadman, who is gay, told 9News that his Colorado Civil Unions Act (SB 11) will get its first hearing in the Senate Judiciary Committee on Wednesday. It is Steadman's third attempt with the measure. In previous sessions, Republicans who controlled the House blocked the proposals from reaching the House floor. Rather than allowing a vote on the bill last year, Republicans shut down voting altogether, killing nearly two dozen unrelated measures. Democrats regained control of the House in November and elected Mark Ferrandino, an openly gay man who sponsored the bill in the House last year, as House speaker, nearly assuring passage in the chamber. Ferrandino has previously said he would like to have the bill signed into law by Valentine's Day. Governor John Hickenlooper has endorsed the effort.